It’s Thanksgiving month and Almaden’s most popular community event of the season is coming up. 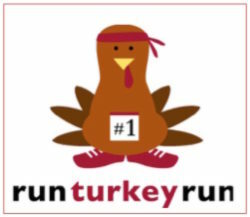 Bret Harte Middle School Booster Club’s “Run Turkey Run 2018” is on Thanksgiving Day, Thursday, November 22, 2018. This family fun run event is the biggest fund-raiser for Bret Harte Middle School, and is gaining popularity with increased participation every year. Both the 5K and 10K runs begin and end at Leland High School on Camden Avenue at 8:30 am. They are run on paved trails along the Los Alamitos Creek trail, making it easy to participate with family members including children and seniors. The registration for Run Turkey Run is open, but prices increase after November 15th. Run Turkey Run spirit T-shirts are also available. All proceeds go to Bret Harte Middle School Booster Club. So, hurry and book your place at the start line! Pumpkin patches, haunted houses, costume parties and great neighborhoods for trick-or-treating. It’s Halloween, and Almaden Valley is abuzz with festive spirit. Here’s what is haunting the neighborhoods this week. Castillero’s Cobra Crypt: This year, Almaden’s Castillero Middle School’s Drama Department has started a new Halloween tradition. 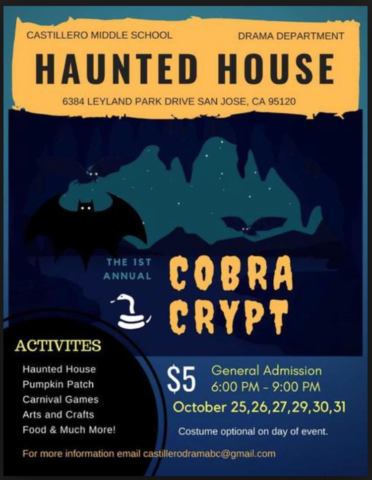 It’s hosting the “Cobra Crypt”, a week-long Halloween fest that includes a pumpkin patch, haunted house, carnival, games and a variety of activities. The fest is every day from 6:00 pm to 9:00 pm till October 31st. Tickets are $5. This is Castillero Drama’s biggest fundraiser, and by all neighborhood accounts, not to be missed. 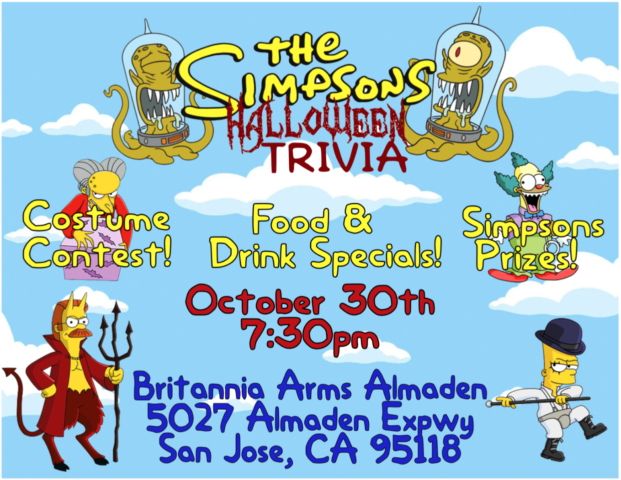 The Simpson’s Halloween at the Britannia Arms: On October 30th, at 7:30 pm at the Britannia Arms, you can enjoy a Simpson’s themed Halloween event. There will be a costume contest, Simpson’s trivia, special food and drinks, and more. Neighborhood trick-or-treats: Almaden Valley boasts some of the best trick or treating neighborhoods in San Jose. Attractive areas include Chateau Drive and the Country Club neighborhood, the Pierce Ranch neighborhood, and the Graystone neighborhood, among others. The biggest attraction might be at Little Falls Drive in the Country Club neighborhood, which draws huge crowds for the spooky haunted house display at the end of the street. Venturing there is well worth it, and give yourselves ample time to park and stroll through the streets. 4th of July 2018 in Almaden Valley – Fireworks, Parade and More! 4th of July in Almaden Valley is traditionally an exciting day of festivities and fun-filled family events. This year promises no less! The Montevideo neighborhood celebrates the 50th year of its annual Independence Day Parade. This is certainly one of the most festive neighborhood celebrations in the South Bay. Events begin in the morning with the ‘4 on the 4th’ Run/Walk through the neighborhood, and then the unique parade with colorful floats. The parade begins and ends at the Montevideo Improvement Association (MIA) Clubhouse, looping through Camden Avenue, Puerto Vallarta Drive, Vera Cruz Drive, Monteverde Drive and Montellano Drive. Both the parade and the run/walk are open to all. The spectacular display of fireworks at the annual Family Fun Festival and Fireworks Show at Almaden Lake Park on the 4th of July is a must watch! Festivities begin at 3:00 pm with various activities for families. There will be a fireworks safety demo and a booth to write thank-you letters to soldiers. There will also be food trucks and booths by various local organizations including the Kiwanis Club of Almaden Valley, which will be serving all-American hot dogs, the entire proceeds of which will go back into charitable activities serving the community. The fireworks show kicks off at about 9:00 pm. The event is free to all, so bring your family and friends. Please note that alcohol, pets, barbecues and personal fireworks are not allowed. The Almaden Lake Park 4th of July celebration is the destination to enjoy a stunning and safe fireworks display. Don’t miss it! /wp-content/uploads/2014/06/The-Swan-Trans-21.png 0 0 Therese Swan /wp-content/uploads/2014/06/The-Swan-Trans-21.png Therese Swan2018-07-02 18:17:192018-07-02 18:17:194th of July 2018 in Almaden Valley - Fireworks, Parade and More! 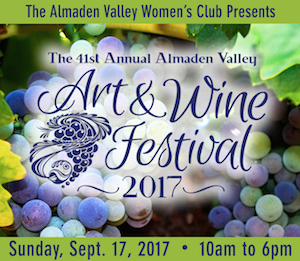 It’s the end of summer, and the grand event that Almaden residents await is finally here… The Almaden Valley Art and Wine Festival 2017! On September 17, 2017, from 10:00 am to 6:00 pm, Almaden Lake Park will be decked out and playing host to festivities featuring a wide variety of arts and crafts from local artists. To complement these festivities, you can savor wine and spirits from seven local wineries and breweries. The festival, now in its 41st year, also brings to you live music, entertainment, and fun-filled activities for the entire family. There are over 80 vendor booths and a fun zone to keep kids occupied. Admission is free and all proceeds are donated to charity. So, mark your calendars for the Almaden Valley Art and Wine Festival. It’s an event not to be missed! If you enjoy observing creatures in their natural habitats, Bats Over Calero at Calero County Park may be just the thing for you. On this tour, the Calero County Park rangers will be taking you on a guided van ride to Bat Inn, deep in the heart of the park. The Calero County Park is a regional park with a variety of recreation areas and activities. 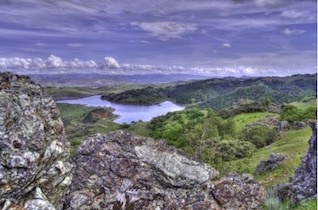 The park primarily includes the Calero County reservoir, which offers a boat launch ramp and host of water activities during the summer, and the “back country” which includes a variety of plant and wildlife habitats. At the Bat Inn, during the twilight hours, you can view thousands of bats as they emerge from the cave after sleeping through the day. Before the tour, there will be a presentation on the life and habitats of bats. Bring a flashlight, a folding chair or a mat and bug repellent. Dress in long pants and sturdy shoes. Please note that flash photography is not allowed on this tour. The tour cost is $15 per person. Making prior reservations for this tour is recommended. Call 408-535-4070. When: July 13th, 2017 – 6:00 p.m. to 9:30 p.m.
4th of July 2017 in Almaden Valley is right around the corner, and Almaden certainly celebrates in style! 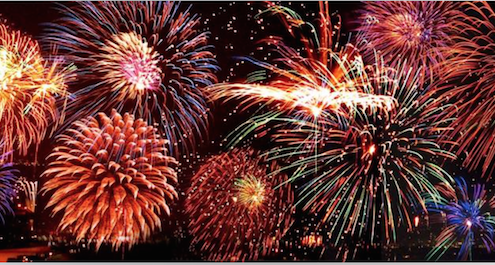 Here are the highlights of some exciting events happening in Almaden this Independence Day. The Montevideo neighborhood of Almaden Valley celebrates the 4th of July with its unique annual float parade, run/walk, and barbecue and pool party at the Montevideo Cabana Club. 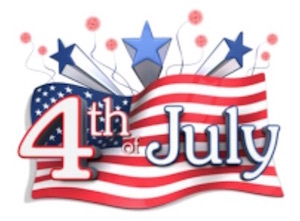 The festivities open at 8:00 am with the 4-on-the-4th Run/Walk (participation fee – $5). The parade begins at 11:00 am and the theme this year is “School Memories”. It starts and ends at the Montevideo Improvement Association (MIA) Clubhouse at the corner of Camden Avenue and Monteval Lane, and will pass through the following streets: Camden Avenue, Puerto Vallarta Drive, Vera Cruz Drive, Monteverde Drive and Montellano Drive. The Fourth of July Parade within Montevideo is one of the most vibrant neighborhood celebrations in the South Bay. In addition to the public parade and run/walk, the Montevideo Cabana Club will also host a private barbecue and pool party for its members and guests. For more details, visit: http://blog.miahomeowners.com. The Almaden Lake Park will come alive again this 4th of July 2017 with its spectacular annual fireworks display. Thousands of Almaden residents throng to this beautiful lake to see this dazzling show. The event begins at 3:00 pm with entertainment by the radio station KRTY, local band Snarky Cats, and magician Pete E Magic. Activities for children include various arts and crafts, a fireworks safety demo, and writing a letter to a soldier. There are food trucks and booths by various local eateries. The fireworks show kicks off after dusk, at about 9:00 pm. The event is free to all. A couple of tips: Come early to grab a spot, and carpool with neighbors to avoid parking hassles. Alcohol, pets, barbecues and personal fireworks are not allowed. For more information, visit the sponsor website: http://www.krty.com/2017/06/27/almaden-lake-park-4th-of-july. With summer around the corner, there’s nothing more inviting than a dip in the pool. Here’s a roundup of all the Almaden Valley pools and cabana clubs where you and your family can cool off from the sizzling heat. 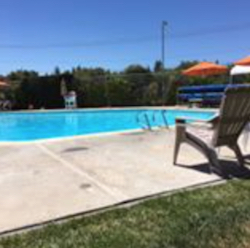 The Almaden Cabana Club is located on Bret Harte Drive and serves the residents of the Almaden Park and Shadow Brook II areas of Almaden Valley. It operates from May to September and is the perfect place to relax with your family and socialize with your neighbors. The club is home to the Dolphins swim team. 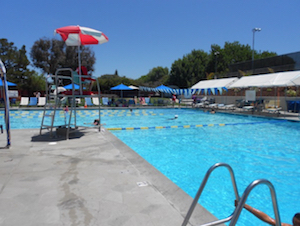 The Almaden Cabana Club also offers summer swim lessons for kids of both member and non-member families. For more information, visit http://www.almadencabana.com. 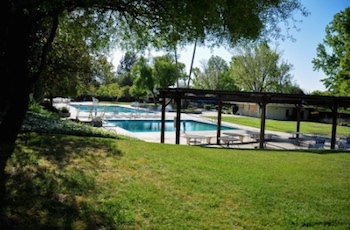 The Shadow Brook Swim Club is a neighborhood cabana club for residents of the Shadow Brook neighborhood of Almaden Valley. Located at the corner of Almaden Expressway and Shadow Brook Drive, this club is home to the Shadow Brook Sharks swim team. The pool is open annually between May and September. The club also offers summer swim lessons to kids. For more information, visit www.shadowbrook.org. The Almaden Swim and Racquet Club is a popular sports and recreation club in Almaden Valley. Serving about 300 members, it is located on Northridge Drive in the prestigious Country Club neighborhood of Almaden. The facility offers a swimming pool, a kids wading pool, and a hot tub, in addition to six USTA championship tennis courts. ASRC membership is open to all, though there is a wait list. The club offers swimming lessons in the summer. For more information go to www.almadensrc.org. The ASRC is also home to the Quicksilver swim team and Masters (QSS), which offers year-round competitive swim training for kids and adults. QSS also has a summer swim team. For more information, go to https://www.teamunify.com/Home.jsp?team=pcqs. Residents of the Montevideo neighborhood in Almaden Valley can swim at the Montevideo Cabana Club. This club is home to the Piranhas swim team and offers summer swim lessons. The club also includes other fun facilities like a volleyball court. For more information, visit http://www.gopiranhas.com. So, get ready for a summer packed with pool parties and grilling get-togethers, and go make a splash! The San Jose Super Run 5K kicks off at Almaden Lake Park on Saturday, Feb. 18 at 8:00 am. Don your cape and be a superhero for the day! Run, volunteer, or invite your friends to this fun event while supporting your favorite charity. The Super Run is a series of superhero themed national running events. It partners with non-profit organizations to raise funds and create awareness for their causes. If you are looking for special holiday displays close to Almaden, you cannot miss the Fantasy of Lights spectacular at Vasona Lake Park. Take your family on a magical drive through the 1.5 mile long holiday lights display. It is a spectacular extravaganza to be enjoyed by both young and young-at-heart alike. 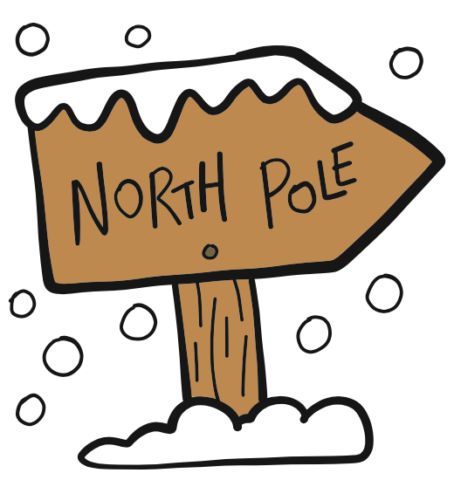 Driving through the park in the cozy comfort of your car, you will pass through over 50 exciting exhibits and themed displays like the Dinosaur Den with the sights and sounds of an erupting volcano, a playful pen of penguins, Santa shooting hoops, pirate cannons blazing and tunnels of moving lights. At the center of it all is a 90-foot twinkling tree for you to gaze at. 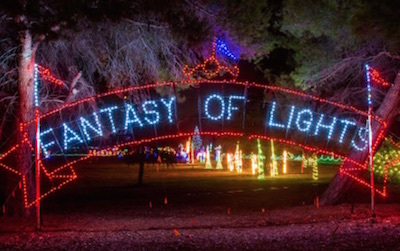 Important: Remember to purchase your tickets in advance to attend the Fantasy of Lights 2016. The park will not admit any cars without a prior ticket. For more information, visit: https://www.sccgov.org/sites/parks/fol/Pages/AnnualFoL.aspx. 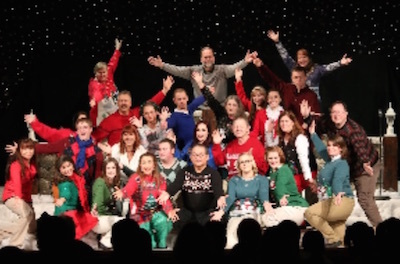 The Foxworthy Baptist Church of San Jose presents a Broadway style Christmas Musical during the holiday season. It has been doing so since 1984, and as a holiday gift to all attendees, the show is presented entirely free. This year, the Church will be presenting six free shows, two on each day between December 9 and 11. The 90-minute show features 30 singers in a fully staged and choreographed Broadway style production. It includes many favorite Christmas songs and special guests including Rudolf, Frosty, SpongeBob, the Grinch and Olaf. They’ll also gather around the manger to celebrate the birth of Jesus Christ, the Reason for the Season, and the Savior of the world. The musical is directed by Don and Diann Fugate. Performances are December 9-11, Friday, Saturday and Sunday, 2.00pm and 7 pm. For more information, visit: http://www.foxworthy.org/upcoming-events.html. 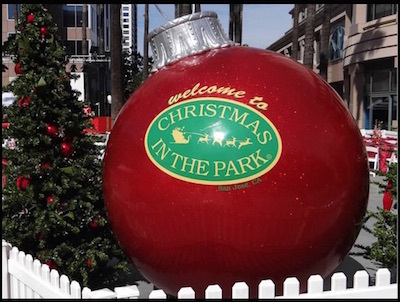 If you and your family would like to enjoy a free and fun holiday event near Almaden Valley, the Christmas in the Park celebration at downtown San Jose is a must do. In December, the two-acre Plaza de Cesar Chavez at downtown San Jose turns into a winter wonderland. At the heart of the festivities is a majestic 60-foot Community Giving tree. Attractions include over 40 animated exhibits with glittering lights and music, a toy train ride and a mini park of Christmas trees decorated by children of San Jose schools. Additionally, there are a host of other rides, games and a variety of foods from local vendors to be savored. You can enjoy free arts and crafts activities every Saturday. Christmas in the Park is open now through January 1. For more information, visit: http://www.christmasinthepark.com/.